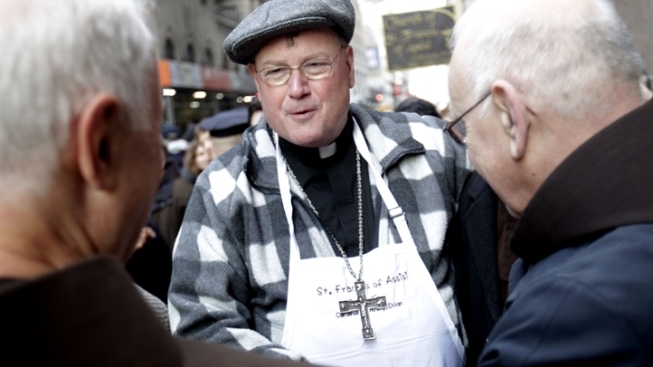 Cardinal Dolan: Lent is Like "Spring Training"
Cardinal Timothy Dolan celebrated his first Mass in New York since being elevated from archbishop, comparing the Lenten season that began Wednesday to baseball's "spring training." "Lent is spiritual spring training — we get the flab out, we get the sins out," he said Wednesday after the rite at St. Patrick's Cathedral. "Our fight is not against the Red Sox or the Cardinals; it's against Satan and sin and selfishness." The head of the nation's largest Roman Catholic archdiocese spoke behind the altar of the Fifth Avenue church a day after returning from Rome, where Pope Benedict XVI elevated him from archbishop. On Wednesday, Dolan wore a cardinal's traditional red cap. But his vestments were purple, symbolizing Christ's suffering for the 46-day period of sacrifice and penance leading to Easter. Earlier on his first full day at home, he distributed bags of food to the hungry at Manhattan's St. Francis of Assisi Church. Compared to those struggling to make ends meet, "the fact that I'm wearing red amounts to a hill of beans," Dolan said of his new status — and the clothing accompanying the highest position in the church besides pope. On Ash Wednesday, the first day of the Lenten season, thousands packed the cathedral for the noontime Mass or to have their forehead marked with Lenten ashes — some by the cardinal himself. At the cathedral's massive entrance portal, Jeanne Howard waited for eight relatives from Massachusetts to attend the Mass. "I think he's a great person," she said of Dolan. By contrast, she added, his predecessor, Cardinal Edward Egan, "was a nice person, but he just didn't have a New York personality — you know, outgoing and friendly." She said she felt Dolan's new status as cardinal was "prestigious." For New York, "it's all a plus," Howard said. The Mass ended with a roar of applause from worshippers packing the pews, with some standing in back and filling side aisles. When asked later whether he was tired and jet-lagged after a weeklong marathon of rituals and socializing in Rome and New York, Dolan said, "The people sustain me. When I walk out and see a jam-packed St. Patrick's Cathedral ... that's what perks me up." He was among 22 Catholic prelates made cardinal by Benedict — his top advisers who will eventually choose his successor. The excitement of the day caught even those who didn't come to pray, but "for the experience," said Melissa Hawkes of Gorham, Maine. She brought along her 9-year-old daughter and 11-year-old son because "it's a social experience and people come for the community." In a city with a reputation for being "a kind of materialistic, secularistic city," Dolan said after the Mass, "you take it from me, there's a soul in New York." His message to the city's faithful was to "get back to basics: prayer, sacrifice and acts of love." And what was the cardinal sacrificing for Lent? "You're not supposed to tell!" the hefty Dolan answered with a hearty laugh. But he offered a hint: "Maybe at Easter you might be able to notice."